I don’t have a great deal of information about Roy Peterson’s history as a hockey player but I know he played during his youth growing up in Manitoba and he continued to play hockey following his move to Grande Prairie. While combing through the Herald Tribune archives I came across a GP Oldtimers team photo dated January, 12, 1971. 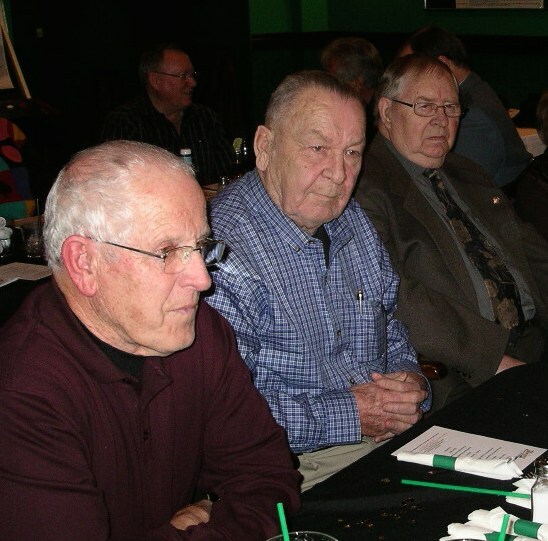 There was Roy and along with him five of our current hockey legends: Pete Wright, Oscar Blais, Ken Head and Roy’s best friend and hunting companion, Max Henning. 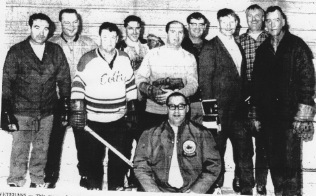 Simon Haakstad, Bob Rigler, Blair Jeffrey, Don Swanston, and Walt Schultz were other members of that team. As a ten year old I respected and admired Roy and the company of volunteers he mobilized but I was unable to fully appreciate their contribution to my development. Now - spin the clock and flip the calendar forward half a century from the time I signed up to play hockey in Roy’s minor hockey program to 2003 when I had the privilege of interviewing Roy who was among the first set of local heroes to be inducted as Grande Prairie Hockey Legends. That was the beginning of a new and treasured relationship I developed with Roy. It was in the context of the Legends project that I learned how much Roy contributed, not only to my development and the development of hundreds of others but beyond that to the development of a mature minor hockey program. There are no longer rinks along the Bear Creek Flats but phantom voices of kids having fun still ring for those of us who experienced the thrill of playing in that romantic outdoor setting. The memories live on in tales recounted by Roy and his hockey protégés. I am proud to be part of the legacy Roy left behind. However, I have no doubt that he would quickly say his most valuable memories and most important legacy are his sons, Rick and Randy. Roy coached both of them in minor hockey. It is obvious that hockey during this period was, and for that matter still is dominated by men and boys at least in visible roles and to my knowledge there were no girls on any of the Bear Creek Flat teams. However, the record shows that Rick and Randy’s Mother Olga was actively involved in hockey while her boys were playing. Along with Fred Dobbyn, Olga coached a team and at one point she won the Grande Prairie Minor Hockey Mother of the Year award. George Vagt was a popular local merchant, a leader in the business community and a sports enthusiast. At the end of each season, trophies were awarded in his honour to the top scorer in each of the three leagues. In 1965, Roy, along with Emily Vagt, wife of the late George Vagt made the presentations. Rick Peterson was top scorer in the Mite Division. 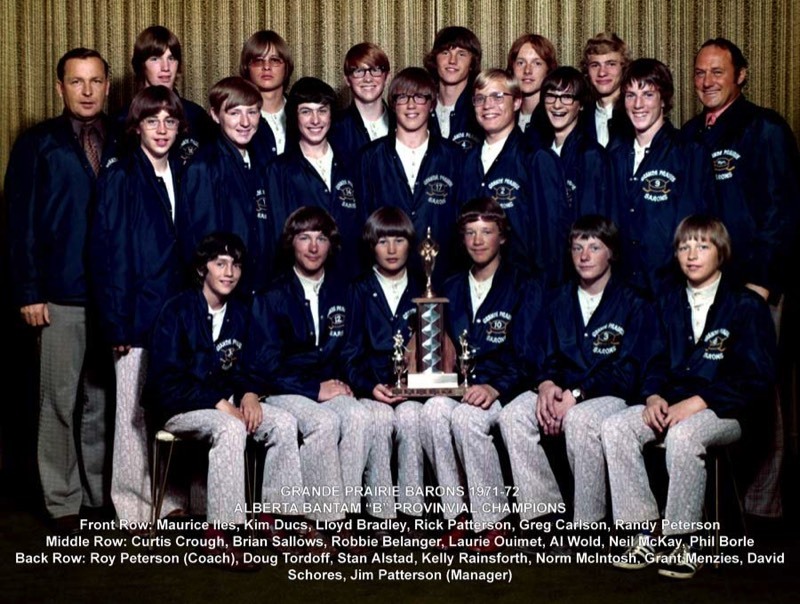 In 1972 Roy’s Grande Prairie Bantam team won the Provincial Championship. Randy played defense on that team. Moving through the minor ranks Rick went on to play for the North Stars where he tied for top spot in the Peace Junior Hockey League scoring race in the 1971-72 season.